Ron Ferguson became Bradley University's fifth athletic director in the post-World War II era in 1978 and when he left the office in 1996, he had taken BU athletics to a new dimension. During his tenure Bradley made one of its largest athletic moves when it left the cozy confines of Robertson Field House for the brand new and much larger Carver Arena. During his term of duty, Bradley basketball returned to the NCAA tournament for the first time in 25 years. He also spearheaded Bradley athletics into a new fundraising era and enhanced or built facilities for softball and soccer. His state-wide reputation helped bring the state high school all-star basketball games to Peoria, and later his expertise was invaluable in assisting the city capture both the Class A and Class AA state high school basketball tournaments for Carver Arena. 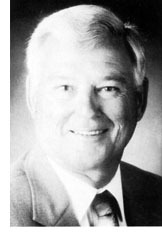 A charter member of the Illinois Basketball Coaches Association Hall of Fame, and also a member of the Bradley Athletic Hall of Fame, Ferguson coached Thornridge to back-to-back state championships in 1971 (33-1) and 1972 (33-0). He was an assistant basketball coach at Illinois State prior to taking over the athletic department at Bradley.